One of the “Five Heroes of Polktown,” James H. Elbert, 8th Infantry. 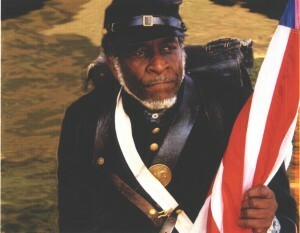 He was 24 when he enlisted in September of 1863. He followed his fellow Delawarean free blacks into the Civil War. James H. Elbert fought in many battles before being wounded at Darby Town Road in Virginia (Petersburg). When sent home to recuperate from his wounds, Pvt. Elbert stayed too long (no one told him to come back) and was charged with being absent without leave (AWOL), put in prison, but found not guilty. Pvt James H. Elbert of ‘C’ Company lost 300 of his comrades in the Battle of “Olustee, Florida. Today his gravestone can be viewed in the African Union Cemetery at Polktown near Delaware City. It reads, “James H. Elbert, Co ‘C’, 8th U.S.C.T. Source: David Orr and Willis Phelps, members of “Friends of the African Union Cemetery”.